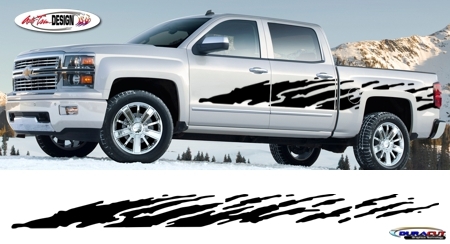 Make your vehicle stand out with this great-looking "Shedder" body side graphic kit. Available in two (2) sizes, kit is offered in a wide variety of colors. While graphic is shown on a Chevrolet Silverado, kit can be applied to and will look awesome on other vehicle types and brands. Slight trimming required at door jambs, cab/box connections, fuel door, wheel well and taillight areas.